Cranbrook is a unique ecotourism attraction located on Jamaica's north coast at Laughlands in the parish of St. Ann between the two main tourism and cruise ship towns of Ohio Rios and Montego Bay. Take a nature walk along the banks of the Laughlands River. The walk will invigorate you as you traipse through a rainforestlike environment with the river tumbling over large boulders as it rushes by. Situated on 130 acres including 40 acres which are landscaped, it was opened to the public in May 1997. This multifaceted property boasts exotic tropical gardens, lawns, water pools and a tropical rain forest. Stop and gaze at beautiful and exotic tropical plants and flowers. An old sugar mill serves as a gift shop and museum. This spot is ideal for family picnics, weddings and other functions. You can also go horseback riding or bird watching at Cranbrook. A hiking trail along the Little River leads to the head of the river where it rises out of the ground. This award winning attraction is highly acclaimed both locally and overseas and is regarded as an essential component of the itinerary of visitors to the island. 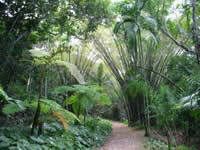 Cranbrook offers an exotic tropical Flower Forest and an exciting River Head Adventure Tour. Other activities include wading in the Little River, bird watching, nature walks, pond fishing, volley ball and children's play area. The Flower Forest has a variety of floral themes intertwined with lawns and open spaces in varying sizes up to four acres. Flowering plants and ornamentals include orchids, begonias, gingers, heliconias, bird of paradise, yellow alamander, Ixora, hibiscus, red euphobia, yellow shrimp, crotons, ferns, bromeliads, philodendron and palms. The River Head Adventure Tour begins on the lawns of the entrance gardens and takes a path through the beautiful gardens and walkways. Making its way along the bank of the Little River the trail passes under a canopy of bamboo trees and gently makes its way up into an unspoilt, natural tropical rain forest. The sound of water cascading over rocks and trees reaching for the sky heralds the approach to the cathedral like gorge where the river rises from a pristine pool at the foot of the rocks. This is the river head, natural and unspoilt. The main facilities are clustered near the property's entrance and the central building is part of an old sugar mill which has been rebuilt. There is a small gift shop and snack counter with outdoor dinning area are adjacent to the car park and entrance kiosk.